Death Takes the Cake by Melinda Wells, a Mysterious Review. 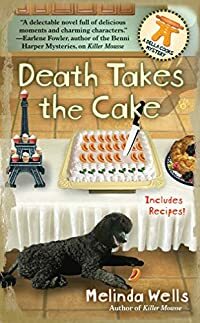 Review: Death Takes the Cake is the second culinary escapade for cooking school owner and new cable television personality Della Carmichael. The series is written by Melinda Wells. When she is told by her boss Mickey Jordon that she is to participate in a baking contest, Della is all for it. That is, until she finds out she must use as a base for her creation Reggi-Mixx. Della not only believes that Reggi-Mixx is the worst cake mix available, but her old college adversary, Regina Davis, is the owner of the company. Over twenty-five years ago someone was stealing money from some of the college dorms. Della was able to prove that Regina was the thief. When Regina was expelled she vowed to someday get back at Della. It's been more than twenty-five years; would Regina still be out to seek revenge? When Regina is found murdered on the set of the cooking show, Bill, one of Della's closest friends, is taken in for questioning. Another dear friend, Iva, Mickey Jordon's wife, afraid she would be accused of the murder, tells Della that Regina had hired a private investigator by the name of Taggert who had threatened to expose her sordid past to her husband. Della confronts Taggert and presses him into giving her the file he had prepared for Regina. Just hours later Taggert is found dead, murdered. Are the answers to the questions of who killed Regina and Taggert in the private investigator's folder that Della now holds in her possession? Death Takes the Cake is full of good humor, engaging characters, and flawlessly planned suspense. It's a real treat (pun absolutely intended). Readers will not only be charmed and seduced by a solidly plotted culinary mystery with some light romance on the side, but also be in possession of a list of exquisite pastries in the form of recipes included at the end of the book. Special thanks to guest reviewer Betty of The Betz Review for contributing her review of Death Takes the Cake. Acknowledgment: Melinda Wells provided a copy of Death Takes the Cake for this review.